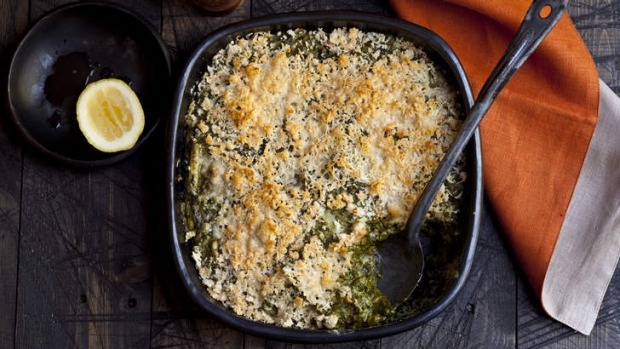 Humble silverbeet is transformed in this rich, tasty gratin, with two vegetable textures, a golden cheesy crust and the crunch of toasted breadcrumbs. 1. Cut the silverbeet into three-centimetre lengths, including most of the stalk, discarding the woody ends. 2. Bring a large pot of salted water to the boil and cook the silverbeet for six minutes. Drain well and press out the excess water in a sieve. 3. Heat the oil in a large frying pan, add the onion and garlic, then fry until softened. Add the silverbeet and cream, then grate in the nutmeg and season. 4. Bubble the mixture over a medium heat until the cream has reduced by about half. 5. Transfer half the silverbeet to a blender and blitz until smooth, then return to the pan and stir back through. 6. Tip into a gratin dish and sprinkle over the crumbs and cheese, dot with butter and bake with the grill on for 10 minutes, or until the crumbs turn golden and the cream is bubbling. Squeeze the lemon over the top and serve. Serve with Karen Martini's porchetta, and Jap pumpkin side dish.